I've been using the Klinik for 4 years now. 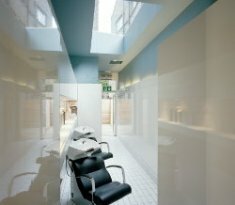 The salon has been recommended to me when I first moved to London and I have only used the Klinik ever since for my hair cuts. I have curly hair that needs to be cut well in order to maintain its form when dry. I had my hair cut by both Anna and Jenni and both did a great job. I'm pleased to have 2 people I can trust with my hair. I can't recommend the Klinik enough.